It's not as if in-flight calling is a novel idea: Numerous airlines have given it a shot, and the US government has emphatically put the kibosh on it. Until now, however, making voice calls from 30,000 feet has often required that airlines retrofit their aircraft with additional equipment -- a costly investment that invariably gets passed down to passengers. In the case of Gogo's forthcoming Text & Talk service, though, customers will be able to make voice calls and send text messages using the same in-flight WiFi service they already use for web surfing. Additionally, Gogo has inked agreements with 200-plus carriers worldwide, which means you'll be able to use your own phone number in the air and simply "roam" onto Gogo's WiFi network. Unfortunately, it's still unclear when the service will roll out, how much it will cost or which airlines will offer it. 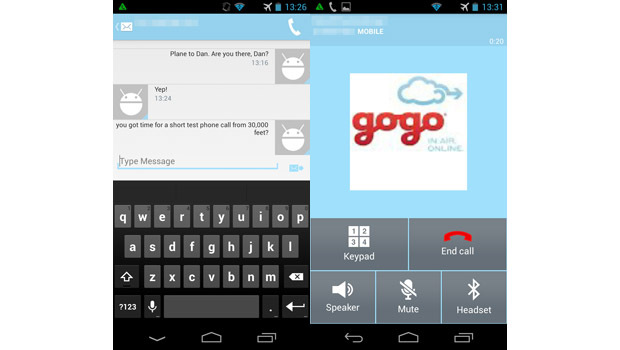 One thing's for sure, though: Gogo doesn't expect any US airlines to support voice calls. In fact, says a company rep, the service might be called "Gogo Text" here in the states, with nary a mention of "talking." The only catch -- if you can call it that -- is that to use the service, you'll need to download Gogo's free Text & Talk app (available for iOS and Android) before you take off. Additionally, you'll need to register your phone number while you're on the ground and still have access to your regular service provider -- basically, Gogo and your carrier need to do a virtual handshake and confirm that you are, in fact, a customer on that network. It's a quick and easy setup process, as the screenshots below can attest; it's just not something you can do impulsively mid-flight. Though the service hasn't launched yet, I had a chance to try it out on the Gogo One, the same flying laboratory where I once tested Gogo's 9.8 Mbps in-flight WiFi. (This time, I had a lucky reader on board with me.) For whatever reason -- unfinished software, the fact that I was at an airport in rural Illinois -- I wasn't able to complete the registration process on my own Verizon phone. (It didn't help that I also had a patchy signal.) So, Gogo lent me an iPhone 5s and a Moto X, both of which had already been set up. Once I had a working device in hand, I had no problem getting online. As always with Gogo's in-flight WiFi service, you can't use it below 10,000 feet, which means the FAA's new policy about using mobile devices during takeoff and landing won't make a difference here. Texting from Gogo's app works well, which is good news, since it's the only thing passengers in the US will be able to do with it. What is there to say, really? Just select a number from your contacts or enter the number manually, and start texting. I happened to be texting with a friend who was paying close attention to his phone, and he responded to my messages as quickly as he normally would. If there was a delay in the transmission (and I don't think there was), I didn't notice it. The only caveat is that the app currently supports simple text messages only. If you want to attach a picture, you can still do it on iMessage, but with Gogo, at least, you're out of luck. Voice calling, on the other hand, still has a ways to go before people will really want to make calls in-flight. After making numerous calls on the Moto X and a borrowed Galaxy Note 3, I consistently had trouble hearing my callers (though they had no problem hearing me). Using a Jawbone Bluetooth headset helped cancel out the roar of the plane engines to some extent, but even then, I had to concentrate in order to hear the person on the other end. As you'd expect, I also had better luck when the person on the other end was speaking relatively loudly, which isn't something I normally have to ask of people when making calls over Verizon. Interestingly, too, the audio quality was slightly better on the Note than on the Moto X (even without the Bluetooth headset), so your results may also vary depending on the phone you're using. Also, even when I could hear people, there was a slight delay -- not uncommon for WiFi calls. Slightly more impressively, four of us on Gogo's test plane were at one point making phone calls simultaneously (we were initially encouraged to only go two at a time). That speaks to the robustness of the network, but then again, do you really want lots of people blabbing away in coach? Fortunately, at least, so long as it's this difficult to hear people, passengers might be dissuaded from making non-urgent calls. And who knows? If airlines charge as much for voice calls as they do for the relatively slow WiFi, maybe passengers will pass their boredom by playing Bejeweled instead.